Unlike the previous one where you could barely see the phone, the new one actually takes you through some of the key features of the device. The Samsung Galaxy S4 isn’t available yet but thanks to the ROM Dump, you are now able to download all 7 high-resolution wallpapers! 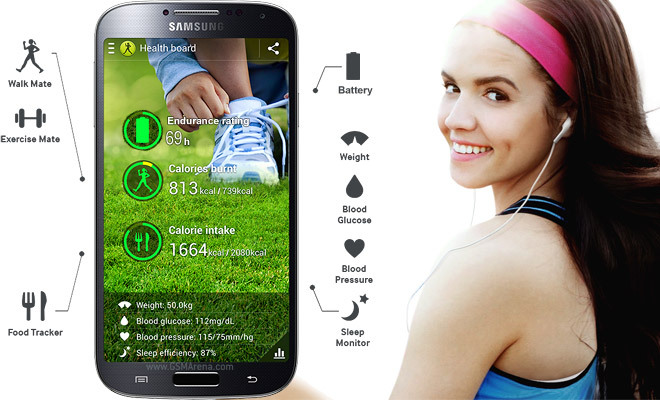 Samsung Galaxy S4 will be from available April. All you need to know about the GS4 is right here. Samsung has just officially announced their Galaxy S flagship 2013’s version : the Samsung Galaxy S4 at their Mobile Unpacked Event 2013 Episode 1 in New York, USA. 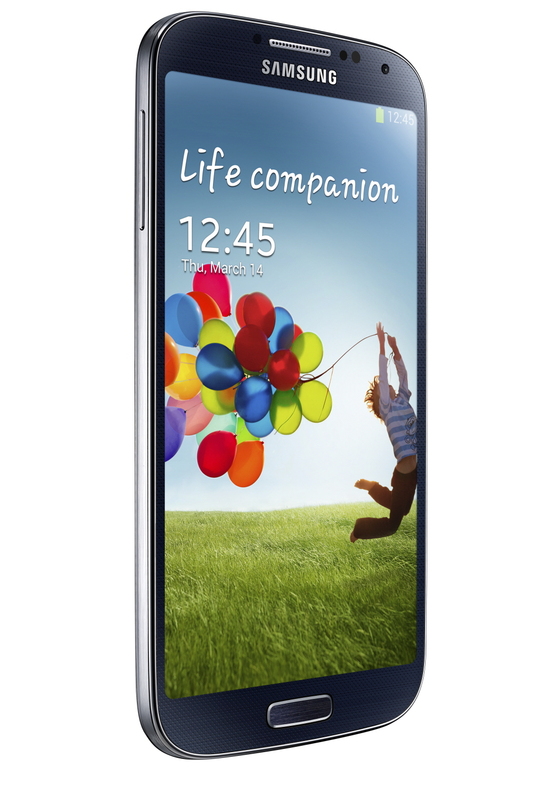 The Galaxy S4 features a stunning 4.99-inch Full HD (1920×1080) SuperAMOED display. Which offers a pixel density of 441 ppi and the ability to use your gloves at the same time, your eyes won’t be able to distinguish the pixels, which ensures excellent visual comfort. Samsung’s latest flagship device will feature Samsung’s latest Exynos 5 Octa-Core (5410) CPU based on ARM’s big.LITTLE technology with Quad Cortex-A15 cores clocked at 1.6GHz and Quad Cortex-A7 cores clocked at 1.2GHz or the Qualcomm Snapdragon 600 CPU clocked at 1.9GHz (Depending on the market), PowerVR SGX 544MP3 GPU running at up to 533MHz or the Adreno 320 GPU (Depending on the Market) and 2GB of RAM. On to the imaging details, the GS 4 sports a 13MP BSI camera with f/2.2 aperture and autofocus, while the front-facing camera gets a slight bump in res to 2MP. Samsung claims that neither camera features any shutter lag, so we’ll be eager to test it out. But some of the most intriguing aspects of the camera are the new features: dual-video capture mode, which lets you record video on both cameras simultaneously (much like on the LG Optimus G Pro), and Dual Video Call mode, in which you can make video calls and show the caller what you’re looking at. Additionally, Drama Shot utilizes burst mode to create animated GIFs, while Sound & Shot can record up to nine seconds of audio to accompany a still photo. The Galaxy S IV comes pre-loaded with Android 4.2.2. The device features Samsung’s latest Nature UX 2.0, we really liked the original Nature UX on the Galaxy S III and the Nature UX 2.0 simply looks amazing. ::::::: The GS 4 will also take advantage of the same “Smart” gesture features we saw on the GS 3, and gives you a few more to enjoy. Smart Pause stops the video you’re watching if your eyes drift away. Smart Scroll will move the screen up or down when you tilt the phone and look at the screen at the same time. Air View is also available on the Galaxy S4, just like the Galaxy Note II, but in this case we use our finger instead of the S-Pen. Air View lets you use your finger as an S Pen by giving you a preview of an email, calendar appointment, image gallery or video just by hovering your finger over it. There’s also a Group Play feature that connects networks of GS 4 devices (provided they’re in close proximity) to share music in a surround-sound mode or play games against each other. 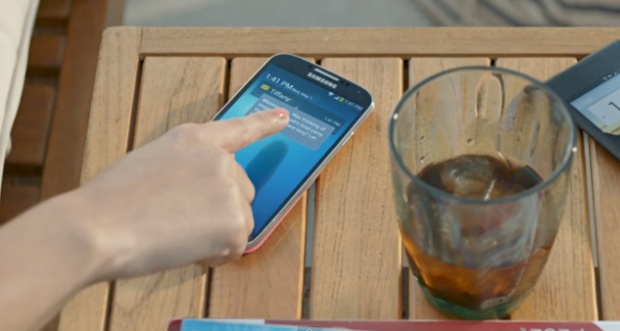 In terms of connectivity, the Galaxy S4 offers WiFi 802.11ac support on top of the usual a/b/g/n, and an IR blaster is included for remote control access using Samsung’s WatchON service. NFC, Bluetooth 4.0 + LE are included, and it’s got MHL 2.0 and is able to use a standard MHL connector. There are a ton of sensors on the device too, including: Accelerometer, RGB light, Geomagnetic, Proximity, Gyro, Barometer, Temperature & Humidity, Gesture. 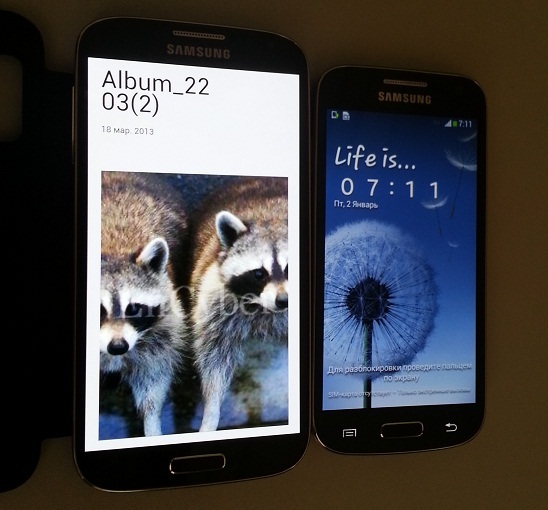 The Galaxy S IV comes in 3 storage options: 16GB, 32GB and 64GB. The storage is also expandable via a MicroSD Slot. The device is comes in two different colour variants, White and Black. Dimension-wise, the GS 4 is 136.6 x 69.8 x 7.9mm (5.38 x 2.75 x 0.31 inch) and weighs 130g (4.59 ounces). The chassis itself is actually 0.8mm skinnier, 0.7mm thinner and 3g lighter than its predecessor, which is impressive given its larger screen size and 2,600mAh battery. It will launch in black and white hues, though Samsung plans to add more colors to its lineup as the year progresses. Head below the break as we continue to reveal what else you can expect from the newest Galaxy device. No pricing has been set, and we’ve been told that the phone will be released globally starting at the end of April. It will come to all four national networks in the US as well as Cricket and US Cellular, and it will be picked up in other markets by Deutsche Telecom, EE, H3G, Orange, Telenor, Telia Sonera, Telefonica and Vodafone (we imagine this is only a short list of carriers for now, however). The full press release with more details is below, and we also have a full hands-on preview up for your viewing pleasure. New York, USA, March 14, 2013 – Samsung Electronics announced today the fourth generation GALAXY S, the GALAXY S 4, designed to get you closer to what matters in life and bring your world together. With ‘S Voice Drive’ you can activate commands via voice control for optimization when driving. Once connected with a car Bluetooth, the phone automatically turns into driving mode converting text to speech so you can easily and safely check messages with no need to look at the screen. 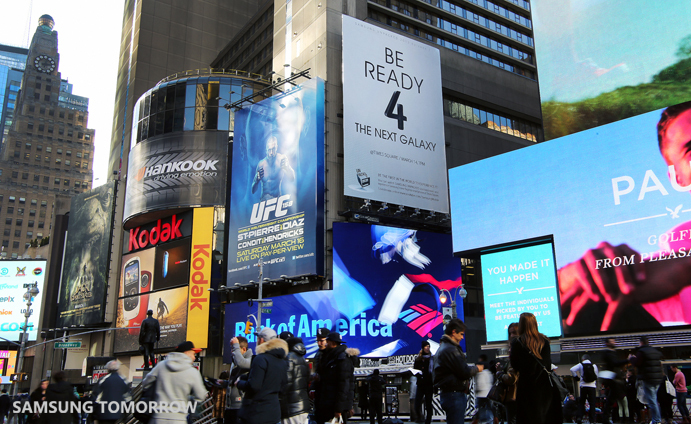 March 14th is the big day for Samsung, and in case you’re unsure what’s important about that date, just take a look at Times Square in New York. The Galaxy S IV is supposed to feature an 1.8 GHz Exynos 5 octa-core chipset and offer a 4.99-inch screen of FullHD resolution (resulting in 441ppi), 2 GB of RAM, and Android 4.2 out of box. Be sure to check back with us next week for our full coverage of the event! For the record: Samsung 2013’s flagship (Samsung Galaxy S IV) will make its debut at 7PM ET at Radio City Music Hall in NYC. And ofcourse, we’ll be liveblogging the event, so mark the date! March 14th in New York you’ll know everything.